Based on carefully selected weekly parasha and holiday messages from 5770 and 5771, the title is taken from the verse in the kriyat shema prayer. Great effort has been invested in producing an esthetically-pleasing Torah work whose profound ideas are clearly and easily conveyed. The hardcover edition – On The Torah contains 394 inspirational pages plus a glossary for those who may not be familiar with all the terms. 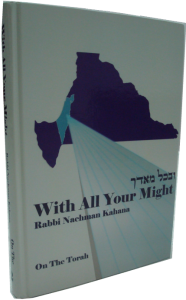 “Rabbi Nachman Kahana has produced a work that will engage the reader in an uplifting adventure of the spirit. This sefer bears a wrenching message that is absolutely vital for the Jewish people now. There are no secrets here, there is no hidden agenda that lurks beneath the surface, and no subtle nuances that have to be discovered. 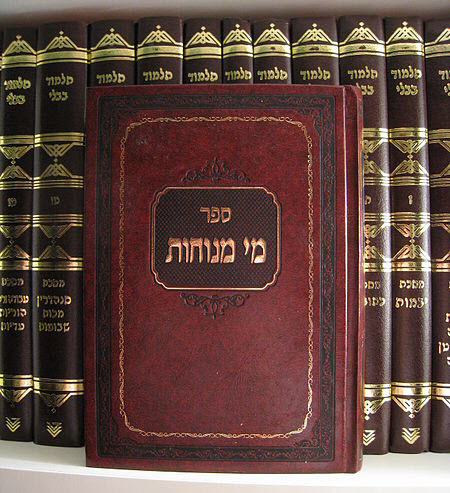 Rabbi Kahana has a very clearly defined purpose that is the theme of this sefer and is evident from the very beginning. He pulls no punches, gives no quarter, brooks no excuses , and no holds are barred. This sefer is permeated with a message that is at once compelling, distributing, haunting and yet soaring with religious intensity. Reb Nachman speaks from his heart to his fellow Jews. He is propelled by three intense loves – the love of Eretz Yisrael, the love of Torah and the love of the Jewish people. He craves for these three to finally be joined together. Rabbi Kahana’s message is presented through the medium of beautiful and brilliant Torah insights on Parshat Hashavua, that are oftimes simply startling in their depth and creativity. “One day I came upon my close friend, Reb Aryeh, who was crying. ‘Are you crying because of tomorrow’s inspection?’, I asked. Reb Aryeh replied that sadness overcame him because tomorrow will be Sukkot and ‘…we don’t have a sukkah to sit in, nor the four species to hold (lulav, etrog, hadassim and aravot)’. The following morning Reb Aryeh came to me with a happy look. He cried out ‘Thank HaShem, we have a sukkah and the four species to hold. I thought Reb Aryeh was losing his mind. ‘Where are we to get a sukkah and the four species in this hell-hole?’, I asked. Then Reb Aryeh took my hand and said very slowly, as a teacher would to his student, ‘The Gemara says that one of the reasons for sitting in a sukkah is to recall the clouds which covered the Jewish camp in the desert. Look! A cloud is covering our camp. It is the cloud of smoke ascending right over us from the crematoria. This is to love HaShem “with all your might”. This is the new world that will appear at the end of all human folly. 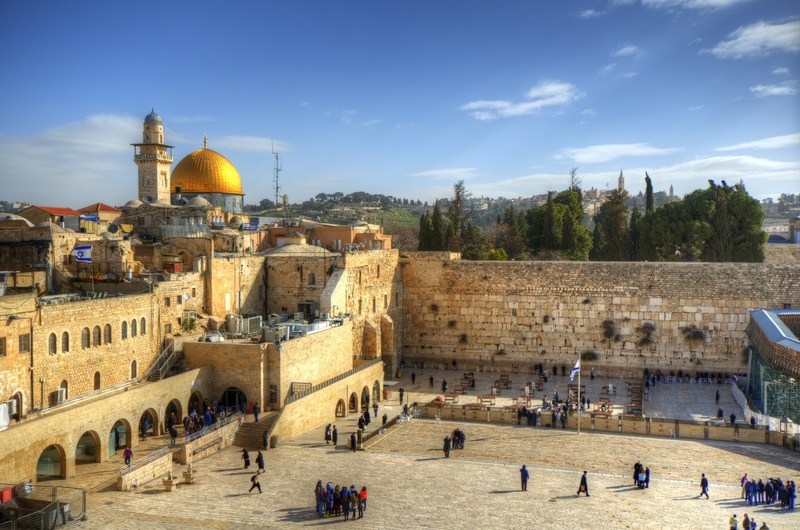 … When one says “I trust in HaShem” (as on the US bills “In God we trust”) the implication is that one is certain that a specific promise made by HaShem will be kept. The promise of a Mashiach, of techiyat hamaitim (resurrection) and all HaShem’s commitments, as voiced by the prophets, will some day become realities. Because I believe in God and His integrity. Whereas, the phrase “I trust Hashem” implies total, unqualified confidence that Hashem will be merciful and compassionate to His people Yisrael even when a specific promise was not made. Just as a child blindingly trusts his parent’s dedication to his well-being. One who lives in Eretz Yisrael with its myriad problems and enemies, voices a thunderous statement that he “trusts” that HaShem will be merciful to His loyal people here, even without a specific promise via a prophet. But after hearing the fretful whining of so many spiritual leaders from the galut , especially from the US, the only conclusion that I can make is that they are suspicious of HaShem’s motives and intentions. In the deafening cacophony engulfing the world at this time, what contribution can the shrill voice of this message have for the Jewish mind? The world is aghast at the violent bloodshed being carried out by Arabs against Arabs. In Egypt close to 100 were killed in the ten days of uprising. In Yemen about 10 were killed, in Libya about 10,000, in Morocco 5, and in Bahrain about 20. The conscience of the civilized world is inflamed by the numbers which could reach about 20,000, and demand the end of the barbaric treatment of innocent demonstrators. And as the numbers rise, so too does the motivation of the masses in their demands for the downfall of the established leaderships. If we cannot understand HaShem’s intentions, we can perhaps glean some understanding from His timing. All this is going on in and around the days of Purim katan in Adar One. The Megila records that Achashverosh permitted the Jews to defend themselves on the 13th of Adar against their murderous neighbors in the 127 areas under the King’s control; on that day, the Jews killed 75,000 of the enemy in the outlying areas. An additional 800 were killed in Shushan, the capital, in the two days of fighting there on the 13th and 14th of Adar. 75,800 in two days. That number is vastly larger than what we are seeing today in the Arab countries, yet there is no recorded call by the people for Achashverosh’s head or for the end of the monarchy. Order your copy from Rabbi Kahana now!